This page is about the German fighter Bf 109 G-14. For other uses, see Bf 109 (Family). The Bf 109 G-14 is a rank IV German fighter with a battle rating of 5.7 (AB), 5.3 (RB), and 5.0 (SB). 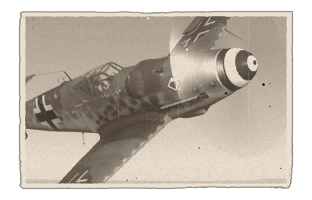 This fighter was introduced in Update 1.47 "Big Guns". Just like its predecessors, the G-14 should generally be utilized as an energy fighter/ Boom and Zoomer. While it's fairly more manoeuvrable than other Bf 109's, it's increased agility should be used for maintaining high speed and energy than dog fighting, which even the G-14 is only passable at best. Due to its excellent energy retention and climb rate, it is exceptionally good at stall fighting, since many fighters will not be able to keep up with its climb rate, giving it the opportunity to put overconfident pilots in vulnerable situations. When it comes to selecting armament, it is largely dependent on the role the pilot intends to fulfil. Equipping bombs should generally only be considered as a last resort or when air cover is sufficient to facilitate tactical bombing. The very potent 30 mm cannon and gun pods should generally only be done if there is a significant threat from enemy bombers and heavy fighters. Keep in mind that while the 30 mm shells pack a high explosive filling, their muzzle velocity and ballistic coefficient results in a slow and fairly inaccurate shell. If chasing after enemy fighters, with a minimal profile exposed, it is not unusual to see 30 mm shells doing minimal damage to wings due to not detonating. Ideally, the 30 mm should only be fired against large frame aircraft from angles at which they expose the most of the plane's frame to ensure a detonation within the airframe. Keep also in mind that the Mk 108 only carries 65 rounds of ammo for the centre-mounted cannon, and 35 per gun pod, making trigger pulls very costly (especially considering its fire rate). As for belt selections for the Mk 108, it should generally be anything but the default belt due to the higher content of minegeschoß, shells, beyond that it is personal preference since the difference is only cosmetic. Adding the twin 20 mm MG 151 gun pods will substantially increase the G-14's fighting potential and longevity against other enemy fighters, due to carrying a total of 250 extra rounds. Additionally, the 20 mm's ballistic trajectory is very similar to the 13 mm machine guns, allowing for firing both weapons simultaneously at an enemy target. However keep in mind that the gun pods will run out of ammunition faster than the centre-mounted one, so if it happens, it is usually a good indication of when it is time to head back to reload, as not much ammo will usually remain in the centre mounted one afterwards. As for belts, it should generally be stealth or air targets, since every other belt option either sacrifices explosive content and contains more tracer rounds in exchange for better ground attack capabilities which are very poor even with the armoured targets belt. Finally, keep in mind it is possible to carry both 13 mm, 20 mm, and 30 mm weaponry, however, due to the 30 mm's aforementioned poor ballistic properties, it should be mapped to fire on a different button. 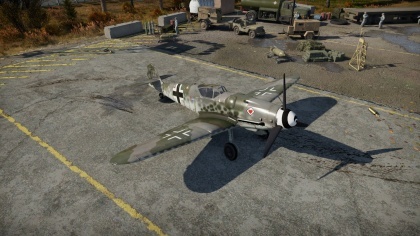 Also remember that while gun pods can be swapped while on the airfield in game, the centre-mounted cannon can't and can only be changed from the hangar. 60 mm Bulletproof glass in front and rear of the cockpit. 4-8 mm Steel plates on pilot seat. 10 mm Steel plates around pilot's head. 21 mm Steel plate on the rear of the fuel tank, with 4 mm plates surrounding it on other sides. The Bf 109 G-14 represents the utmost technological achievement of the Bf 109 Gustav series of aircraft. Like both the G-10 and the G-6, the G-14 can be modified for either bombing duties, intercepting bombers, or improving it's firepower against enemy fighter. However, the G-14 both possesses a more powerful engine and better maneuverability than it's predecessors. In 1943, the Bf 109 G-6 entered service, while its performance was less than stellar, its worth derived from the ability to be easily modified into dedicated fighter bomber, high altitude interceptor or reconnaissance. likewise, great care was taken to make sure the G6 could fit heavy armament for attacking bombers, which were beginning to appear in force over Germany, and the shortcoming of the Fw 190s at high altitude became increasingly apparent. In 1944, the RLM, wishing to standardize fighter production, approved the Bf 109 G-14, which essentially a standardized version of the 109, with all improvements found on late production G-6's, including an enlarged vertical tail surface, a new canopy and Flettner tabs, for better control at higher speeds. to easy construction, it had a non-retracting tail wheel, and the distinctive bulges on the upper cowling, which housed the breechblocks of the machine guns. In addition, the new G-14 was fitted with a DB605ASM engine. itself a heavily modified engine also used in the early G-6. It features water-methanol injection and an enlarged supercharger which is taken directly off a DB506, meaning the engine has better performance at high altitude, while conversely, it has less output at lower altitudes. Serving alongside the 109 G-10 and K-4 in the later stages of the war, it proved to be a less than stellar performer, being outperformed by the newest types the Western Allies brought into service. However, it performed admirably in its role, and with a good pilot, was more than a match for the large majority of the Allied aircraft. This page was last edited on 14 April 2019, at 16:56.